Ardent Impressions Inc. For Tradeshow Marketing, Tradeshow Ideas and Event Promotions. The Easter Bunny is visiting Bay Area malls! Hop on over to Hillsdale or Westgate April 1-15, plus a Santana Row visit April 8. Come see us at the Exhibitor Live show! Booth 1654 in Mandalay Bay. Come get photos with the players and trophys in Jack London Square. Come see us lead the discussion on how to Rock your Tradeshow! San Jose Capital Club, Business Forward Council. Ardent launches new Social Media and FlipBook Promos. Both a big hit with attendees. Sunshine Act Eases Medical Giveaways. Great news for promotional giveaways. We Partner with Reality Engineering For NPI Data. Entice and Thank Caregivers with Gifts via Easy Sunshine Act Compliance. Ardent Launches Gold Key Partner Program! Unlock exclusive benefits and a 10% discount for our event manager & exhibit house clients. Do you ever feel pretty sure about something but just lack proof? This great article on TechCrunch just confirmed what I've always worked off of….that Booth Babes Don't Work - but we know what to do! The Sunshine Act now regulates a wide range of topics from food to expert speakers and requires tracking by companies transferring value to caregivers. But it's great news for the promotional giveaway portion of our industry! Half our business comes through industry partners such as exhibit houses and event managers. To show them more love we have formalized the Gold Key Partner Program, which unlocks exclusive benefits and 10% off. What better way to stand out from your competition but a surprise marketing piece that shows up on your client's desk…with their name on it! 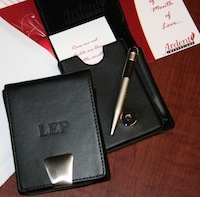 Our key clients were delighted by the classy business card holders we sent as Valentine's Day gifts to thank them for their business in 2011. We teamed up, you got nice gifts free! Ten years ago, Marlys Arnold wrote 'Build a Better Trade Show Image' and to celebrate the anniversary we teamed up with her to give the clients who signed-up nice personalized gifts for free! A catalog containing thousand of unique and exciting tradeshow giveaways is now just a click away under Giveaways on the site. Although Ardent's skilled team is excellent at suggesting options, this new feature allows customers the opportunity to peruse our offerings at their leisure as well.